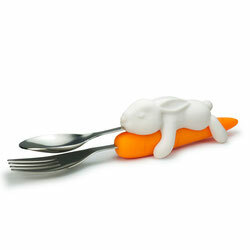 This, perhaps provocative, bunny sticking its spoon tongue out is part of a pair of utensils from the Fred & Friends design team (http://www.fredandfriends.com/). Kind of hate to pry him away from his carrot love! Great for kids' lunches (maybe).